We previously stayed away, due to all of the negative reviews about the loud music/bar on-site. Our experience was wonderful, and we will go back. We stayed on a river front site 17, and the view was lovely. The pool is huge, and kept spotless clean. Hot tub was a relaxing treat. There are boat tie ups, if you camp with a boat. We did not eat or drink at the on-site bar, but never heard any of the music or partying that previous reviewers experienced. Possibly was their campsite proximity to the action. We heard nothing, and slept like babies. We will definitely go back. We camped at Ellie Ray's RV Resort & Lounge in a Travel Trailer. If you want to "camp the real Florida", there are hundreds of better maintained state parks, than this establishment. I have never seen so many cigarette butts, empty cigarette packs, and overall trash at a campground in a very long time, until I came here. the pool is vert small, and frequently closed for various reasons. The sites are tightly packed. Cable coax present, but not functional. The food at the restaurant is disgusting. The breakfast buffet (all 6 pans) had powdered eggs, burnt biscuits, slimy watermelon (covered in flies), and a few items I couldn't tell what they were. We were told dinner was going to be "some sort of pasta in brown sauce". If you want to be nearly run over by children racing around on golf carts (not even trying to obey posted speed and direction signs), or drunk adults blasting Hank Jr. from the same jacked up carts, this campground is for you. We stayed due to having a free 3 day/2 night coupon from an RV show. I would not pay money to stay here. 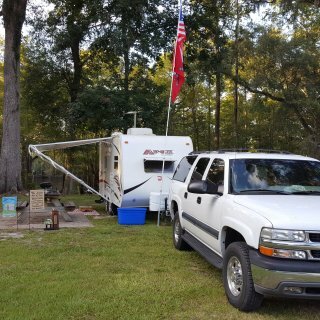 We camped at Spirit of the Suwannee Music Park and Campground in a Travel Trailer. This is the park I judge all others by. The staff are the most helpful bunch, and they always have a smile. 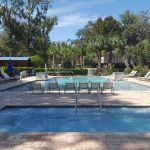 They have an older, more tree shaded section which accommodates their rental cabins, tents, and RV's less than 30 feet. The newer resort type section, has concrete pads, and is much more suited to bigger vehicles. 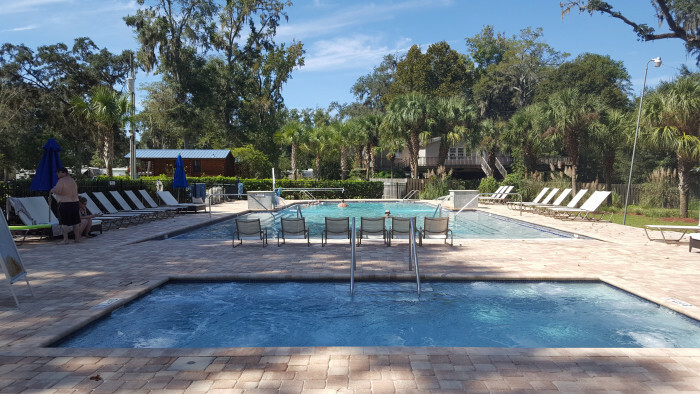 They have the historic Suwannee River, Convict Spring, and pool. There is also a hot tub. They don't use cheap paper bracelets for water access, either. They give you a keepsake rubber bracelet so you don't have a paper wristband stuck to you for your entire stay. There is a great diner/walk up restaurant with desserts the size of your head. Five fenced dog parks. Minutes to a paved state bike trail. Canoe rentals. Shuttle service. There is as little or as much to do as your heart desires. Live music, and planned activities, as well. Well stocked camp store. 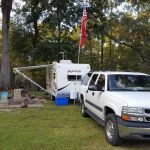 We camped at Suwannee River Rendezvous in a Travel Trailer. This campground is mostly comprised of "live-ins", not campers. There are vehicles parked everywhere, making it difficult to navigate roads and turns. We were wedged in between two resident 5th wheel RV's. One of which had what sounded like a cat dying inside, with not a soul appearing all weekend. Dirty, rude, loud children run rampant with no supervision. This is not a camping experience I would recommend, or repeat. Will not go back. 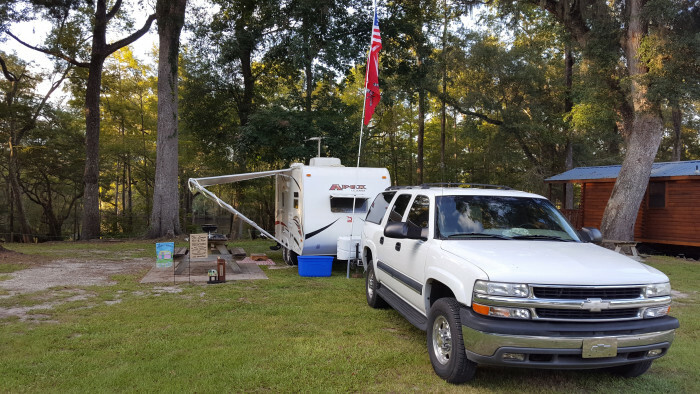 We camped at Eleanor Oaks RV Park (formerly Cattail Creek RV Park) in a Travel Trailer.